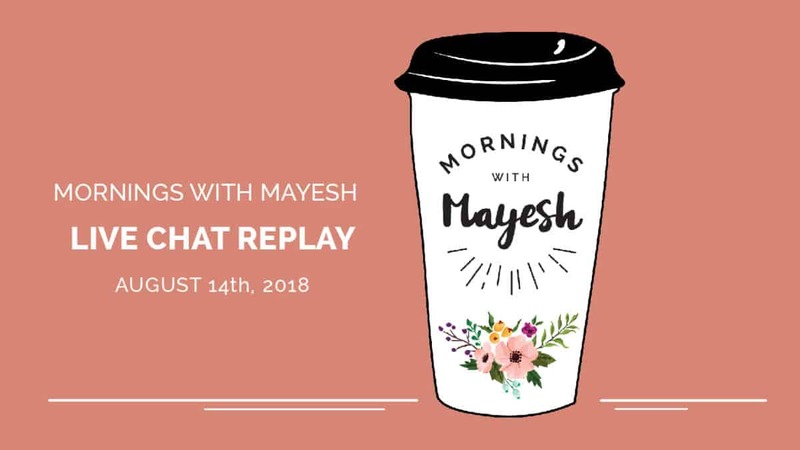 In August's Mornings with Mayesh, Yvonne and Shelley cover a wide array of floral questions. They started the morning with Shelley talking about some of the great products that are available including the VIP rose called Westminster Abbey. Afterwards they answered some great audience questions that range from garden roses & how to care for them, ho w to handle ethylene gas sensitive flowers, to what is the best way to clean up quickly after a large installation, how ordering works for shipping customers, and taking on work that doesn't really match your brand. It was a show packed full of great information, so be sure to watch the replay! From Bridget: What type of product is local in Miami? From Kirsten on IG: Can you talk about the different kinds of garden roses, not just David Austin, and how to prepare them for arrangements and how long they last? From Shelley: whether you are cutting them from your own garden or getting them from us or a local rose grower you will need to first remove the packaging and lower leaves. My rule of thumb is ¾ leaves removed ¼ left on. Use any damaged leaves or guard petals to encourage roses to open place in tepid or room temperature water. Use flower nutrients, changethe water every 24-48 hours and keep away from direct light and heat. Allow roses to open fully for your event. Super fresh, tight roses will take 3-5 days to open. Local garden roses will last about a week depending on variety, but some South American varieties will last 2 weeks. Evelyn: Any recommendations on how to keep flowers in cooler fresh. Having problems with Snapdragons especially. I keep them separated from carnations. From Shelley: Snaps can be sensitive to ethelyne gas so make sure your cooler is clean and filtering properly. Make sure you are cutting with a sharp knife at a 45-degree angle. Keep water cool and clean and use floral preservative. I find sometimes they do well out of the cooler if it is not too hot. You have tip them out as well if they have droopy tips. Generally, they are a long lasting flower. From Desiree: Do most people find astilbe to be a flower that does not last in bouquets because I do. I urge clients to find another flower because I don’t want to water tube and add more weight to an already cumbersome bouquet. Such a beautiful bloom but how can we get past the browning tips and them looking pretty sad mid wedding day? From Shelley: Yes, Astilbe is not known for its longevity that is why it’s best to make sure to buy it in season and especially when it’s offered locally. Astilbe flowers last longer, up to 2 weeks rather than 2 to 4 if placed in hot water first, allowed to cool down and then placed in the cooler. It is a technique that works well with hellebores too. From Brandi: I never had problems with boutonnières previously, but more recently, they’re been super wilty within a few hours of the bridal party wearing them. Super embarrassing and not a look we would like to have. The stems are exposed, however, they are in water right up until they’re being worn. Help?! From Texanna: How do you have beautiful events outdoors with flowers in this heat? What about potted Orchids and Orchids in general and Roses? From Shelley: It is a challenge isn’t it!? Definitely using orchids, plants and heartier flowers like tropicals help. Also, for the first time, we are really seeing a shift in our climate and the environmental changes are really starting to impact us here in Southern California where you could count on really nice outdoor weather year round. It has already started impacting our florists business here. Using a base of silk flowers and then adding in fresh flowers is another option to help combat the heat as well. Remember when working outdoors to wear a hat and gloves and to protect yourself from the heat. It’s really easy to forget how hot it can get when you are setting up outside. Do you all do seminars on arranging? Yvonne: We have some great resources for learning more about flower arranging. First, is our video library that everyone should check out. We have over 400 videos that cover a wide range of design topics and general videos about flowers, care & handling. Typically, we have 1 design video per month that we publish. In addition to our videos, we offer live educational events as well. Currently, we have 1 flower workshop left for the year, happening in Salt Lake City in November. Visit our website for more information. Also, if you want to stay in the know about all of our news & events, then be sure to sign up to receive our emails. Melissa: What is the best way you’ve found to clean up quickly and efficiently at a venue after a big install? From Shelley: A large team is essential and if you can’t afford that get yourself some interns or volunteers and get really organized. Make sure you have your own trash cans, bags, brooms dustpans, carts, dollies, boxes buckets etc...so that you are not at the mercy of the venue and that you don’t have to ask to borrow ANYTHING, Make sure you have a well-stocked toolkit. Give yourself time. Familiarize yourself with each venue you work at and learn how long it takes at each venue and how many people you need. Don’t wing it each time. Get a crew you can trust. IG: As a new florist, I would like for you to walk through the steps of ordering for the first time and things I should know about delivery. I received a related question from Evelyn: How can we arrange ordering from you and getting the best price on shipping? Yvonne: Once you register your business and we get your account set up, you will be assigned your very own sales rep to walk you through all the steps on ordering and shipping. We have 2 different shipping teams. In general, our Miami shipping division handles the East part of the country and our LA shipping team handles the West side. We can work on quoting you costs for flowers including shipping/packing charges. Shipping costs are calculated by actual weight and dimensions of the boxes so each order may differ as far as shipping goes depending on the size of the order. We ship a few different methods, FedEx priority overnight and Air Cargo (Delta/Southwest/United/American) to your nearest airport. Shipping via airlines for orders over 100 lbs. can be significant savings if you are able to go and pick up from the airport. Picking up cargo from the airport is super easy! We will give you the address to the cargo station as to where you will need to go. It's usually in a separate area from the airport so you don’t have to interface with airport traffic. Melissa: How do you reconcile specific floral work you’ve been asked to complete that is not up to par with your personal taste? From Shelley: Ah this is always a toughie. When your new and starting out it is always difficult to turn down ANY business. You will do designs that you don’t love and work you will not want to even photograph. It’s very hard, on the one hand, you need to make a living and on the other, you feel that you are an artist and your artistic integrity is at stake. If it is a bridal client it’s a good idea to have a questionnaire on your website that can help you vet your clients and you can gently refer them out to another vendor. Sometimes it’s a learning experience and we need to learn how to say no to things so we can say yes to the projects we love. But listen, in the business, everything is not always Instagram worthy and you will realize that unfortunately, not everyone out there has the same amazing taste that you do. Your amazing skill will be to help that client make it go from drab to fab-u-lous, honey. That is when you know that you are really doing your thang. Even on a budget. Hey, it’s always easy to make things look great with a big fancy budget, a true artist can rock it with no funds. From Evelyn: Any ideas on promoting flowers during slow times. From Shelley: Instagram Giveaways, dropping off flowers to your local schools, churches, hospitals, funeral homes, local wedding coordinators, coffee shops, offering a bouquet of the weeks deal if you own a flower shop. Hold an educational class for mommy and me so that moms can bring their kiddos in to plant a flower or make a small bouquet. Hold an open house and get folks in with free drinks and food give a discount, Hold a Wedding workshop for the bridesmaids ro learn how to make a flower crown. There are many ways to promote your shop or studio that don’t have to be flower related...maybe a potluck or open mic night. I hosted a Kids Ted Talk at my shop that focused on my eco-friendly practices. Participate in your community and network with other shop owners so that people know you are there and get the word out.